+24 V ±10% at 1A. 0V to +10 V gives 0V to max. kV ±2%. NB: Internal manual potentiometer control not fitted. Less than 100 ppm for 1V change in I/P volts. 0 to ±10V represents 0 to ±max o/p voltage, ±2% output impedance 10 kohm. 0 to ±10V represents 0 to ±max o/p current, ±5% output impedance 10 kohm. 0V to +10 V gives 0V to 3 kV ±5%. 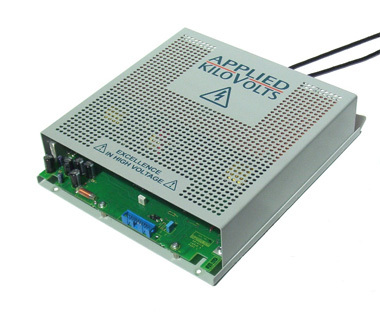 0 to 10 V represents 0 to 3kV o/p voltage, output impedance 10 kohm. < 0.1% for zero to max. load. < 0.1% for 1V change in I/P volts. 240 x 216 x 100mm. nb.Grounding of the case is via fixing bolts. Designed to meet or exceed EN61010.